"Classic Brewery Personalized Glass Beer Pitcher"
"The most important thing about home entertaining is having plenty to serve, and you can pour beer for everyone at the table with our Classic Brewery personalized glass beer pitcher. Made of heavy-duty premium glass, these personalized beer pitchers are custom engraved with the name of your choice, framed by our exclusive Classic Brewery design. A great way to create that real pub feeling right in your own living room. This glass beer pitcher features an easy pour spout and a handle made to help you keep a good grip. Each custom beer pitcher measures 8.75 tall with a 6 diameter, 1.75 handle, and holds up to 60 oz of brew or party punch. Please note that hand blown glass may contain small bubbles. 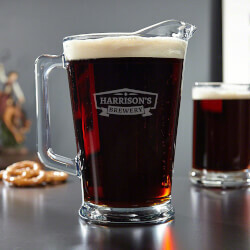 Classic-style glass pitcher for easy serving and a real pub feelPerfect for poker night with the guys or a backyard barbecueCrafted from hand-blown glass; personalized the name of your choiceMeasures 8.75"" x 6"" x 7.75"" & holds up to 60 oz"